Ten more homes in the path of Hawaii's Kileaua volcano eruption have been destroyed overnight by fast-moving lava, a spokesperson for the Hawaii County Civil Defense told ABC News. The most recently destroyed homes were in the Big Island's Leilani Estates subdivision, which was evacuated more than three weeks ago. At least 51 homes have been destroyed since the volcanic emergency began, and more than 2,000 people have fled the area. Only two of the fissures are still pumping lava: #8 and #24. Fissure #7, which was really powerful and forced Sunday night's evacuations, has gone quiet again. Lava from a fissure erupts on a residence in Leilani Estates, on Hawaii's Big Island, May 26, 2018 in Pahoa, Hawaii. 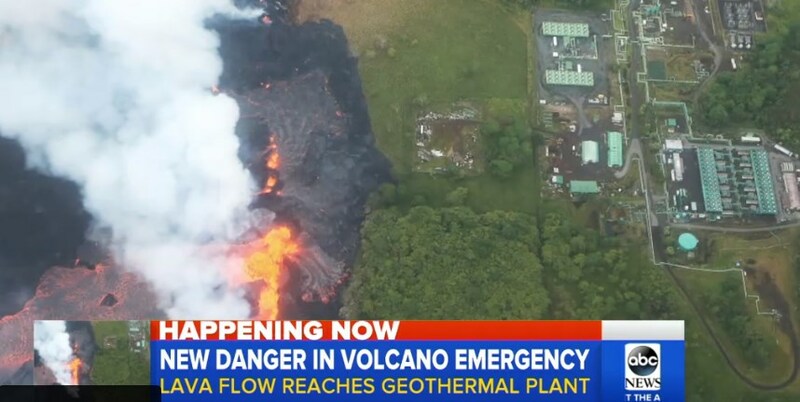 In addition, two of the wells at the geothermal plant were overtaken by lava, but there were no emissions of hydrogen sulfide. That lava flow has stopped on the property so there is no risk, for now, to the other nine wells. The trade winds have died down significantly. So, instead of carrying the plumes of off-shore, there is “pooling” of sulfur dioxide in some inhabited areas. There are no new evacuation orders as a result of the compromised air quality, just the ongoing warning to people with respiratory issues to stay indoors. 0 Response to "Lava from Hawaii volcano destroys 10 more houses in Leilani Estates, officials say"